Here are the 20 most popular blog posts of the year at All LED Lighting, ranked by the number of times they were viewed by readers. This year, the topic of incandescent replacement LED light bulbs did well. Eight of the top 20 posts were about such replacements. The No. 1 post had an environmental subject: the apparently greater impact, by one measure, of LED light on the environment than that of other forms of artificial light. The distribution of page views among the 381 blog posts we published in 2014 was quite top-heavy. The top 20 represent 5.1% of posts numerically, but the page views they garnered accounted for 33.2% of the total. It's interesting that the 20 most popular blogs posted in 2014 were scattered among 21 from 2013 that are still attracting significant traffic. In fact, the largest attractor of page views this year, by far, was Karl Hakkarainen's piece on the Nanoleaf light bulb -- The Ugliest LED Light Bulb -- reinforcing the popularity of incandescent-replacement stories. Two posts focusing on business affairs made it into the top 20: one on the death of the Switch Light Bulbs Company and one on Cree's being named to MIT's list of "50 smartest companies." A surprise winner was about a simple engineering tool -- Bill Reisenauer's Tools for Engineers: The Gannt Chart. Reisenauer and Ed Rodriguez each scored two posts in the top 20. Hakkarainen, Ron Amok, Charlotte Erdmann, and Ron Lenk had one each. The rest were penned by yours truly. Lights of America has been fined $21 million for lying. Serves it right. I only wish more of the liars were being slapped this way. A British consumer testing agency ran 46 varieties of commercial LED light bulbs through a simple lifetime test. Almost 29% failed before 10,000 hours. Indications are Switch may be shut down. I have not been able to confirm this. If anyone has hard facts, please share in the comments. Light bulbs are becoming a gold rush. 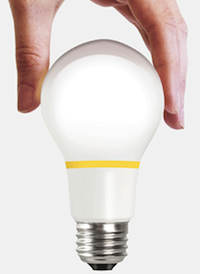 A venture-backed startup has announced an under-$10 incandescent replacement light bulb based on induction technology. A new IC module lets LEDs operate flicker-free directly from 230VAC line voltage, at power levels from 2 W to 70 W.
Correlation is not causation, but participants in a study who got exposure to bright light earlier in the day tended to have a lower body mass index than others. Will Pi Go the Way of Pluto? There is a movement afoot to replace everyone's favorite mathematical constant. Home Depot is selling a 60W-equivalent, three-way bulb under the EcoSmart label. It is dead on arrival. Here's why.